Sure, you weren’t as desirable as some of your stablemates — your parent Campagnolo made you and your kind for only a couple years. You were considered too boxy and unrefined by most aficionados, and didn’t even get more than a passing mention in Frank Berto’s The Dancing Chain. Bianchi had to cut corners somewhere, and that’s why they chose you instead of your sexier cousins. Me, I didn’t mind one bit — your boxy shape was workmanlike and unpretentious — all business. And you performed, and you did it without complaining. I raced you for a couple years in my youth; rode you in rain, snow and blazing summer heat. I damaged your surface in a couple of crashes and some ham-handed wrenching…but you wore your battle scars with pride. Other than routine lubrication and the occasional polishing, I didn’t coddle you — and you didn’t ask for anything more. After 15,000 miles I treated you to a new set of pulleys. That was back in 1991, and since then I’ve added at least another 15,000 miles to your tally. Over the past year, though, you’ve been letting me know that your time on this Earth was short…missed shifts, clatter and an inability to stay where you’re supposed to. Both sides of your pulley cages are twisted and bent and your pivot pins are so wallowed out that you shake when I shift you. Even your return spring doesn’t have the “snap” I’ve come to know and love…it’s too tired to go on. I’ve had so many good memories with you…lots of miles in all conditions with friends new and old. We’ve seen the sights together, from winding mountain roads in Germany to the desolate rural highways of north Florida, from endless after-school training circuits of the W&OD Trail in Washington D.C. to the windswept bridges crossing Tampa Bay. You were always up for a challenge and an adventure, and until recently I could always count on you to do what you do best…manage my chain and keep me rolling. But it’s time, sweet 990; time to pack you up and find a replacement for you. You’ve given me so much, and you’ll always have a place in my heart (and in my spare parts bin). Rest in peace, dear 990 — you’ve earned it. Sitting Shiva for ya- how many days? who had sung its praises before throwing it over for a Trek Madone. 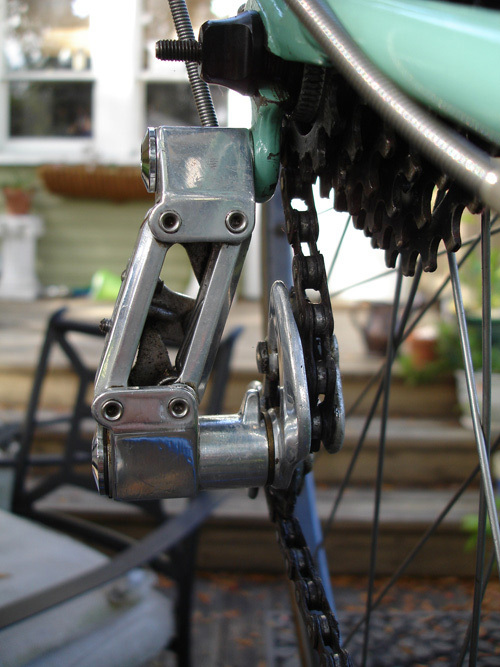 Don’t anthropomorphize rear derailleurs. They don’t like it! Now I’m sad. It’s a beautiful little machine. And I vastly prefer the boxy, no-nonsense design. RIP, Campy. 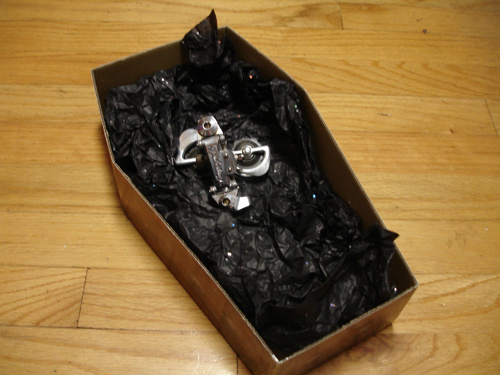 We had a good life together…and I’m sorry to see it go. Thanks, everyone, for the condolences! Pieces of it may live on in future bikes, though — the bolts and pulleys are still in decent shape. Old 990 would be happy to breathe new life into another tired derailleur by sacrificing hardware for “the cause”. bummer…so now are you going to replace it with a super new Shimano? I already scored a replacement, a Pat. 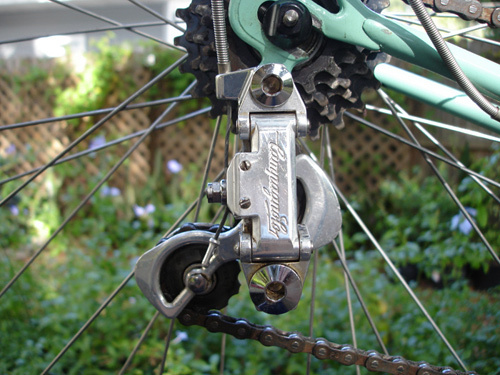 80 Nuovo Record (1020a) derailleur in fantastic shape. Actually built it up from two different derailleurs, using the best parts from each until I had the perfect one. Try THAT with a Shimano component! I have heard that those old time Campagnolo derailleurs have a lifetime warranty. I suggest that you ask them about it and see if you can get your derailleur refurbished. Yeah…that’s not true about lifetime warranties. I wish it were the case, but that’s a persistent Internet myth.